Yesterday, I showed you what is now one of my favorite jams, blackberry vanilla bourbon jam. 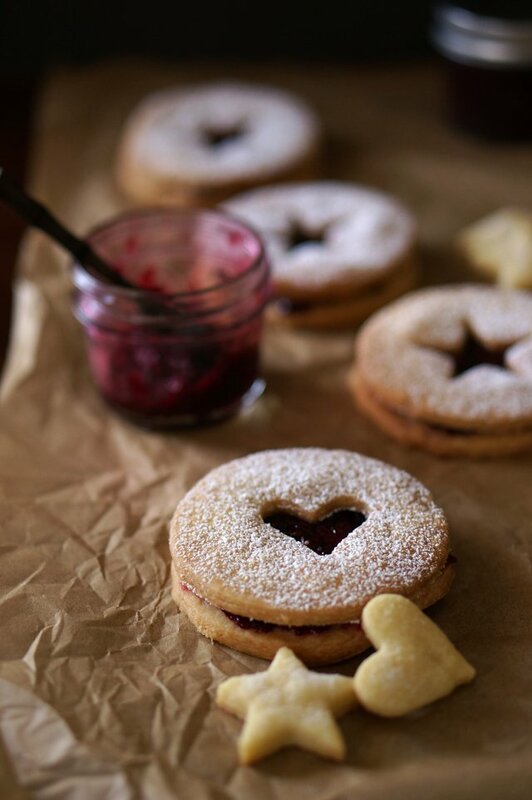 Really this jam is so good it can go on just about anything, but I especially love the deep red-purple jam peeking through a linzer cookie. This is a simplified linzer, without almonds, that is really more of a shortbread. Of course, you can use any jam you want. I played around with different circle, heart and star shaped cookie cutters. 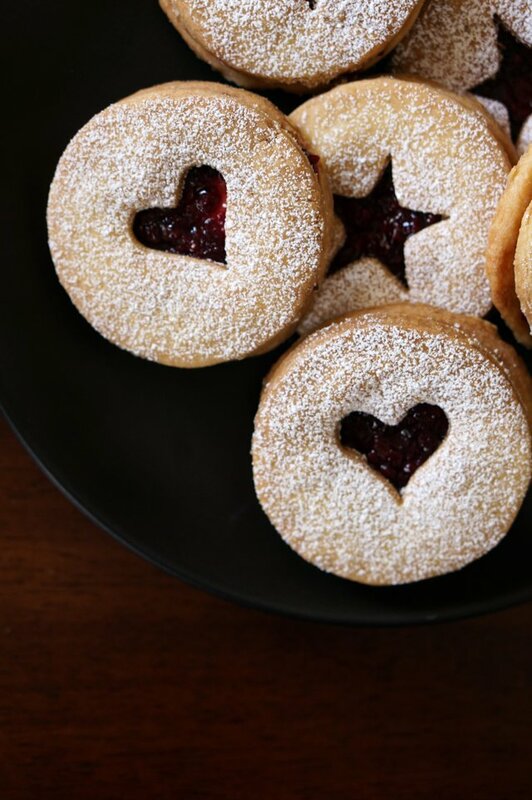 If you don’t have cookie cutters, you can easily make linzer cookies with the edge of cups or ramekins, one smaller than the other. 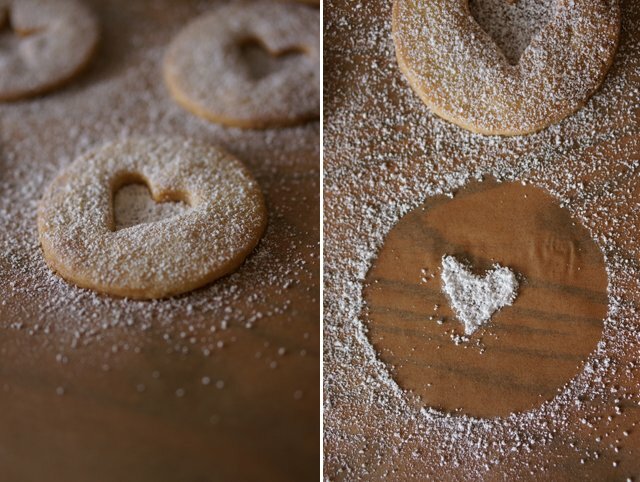 These cookies are simple to make and really beautiful! Preheat the oven to 350 degrees. In the bowl of a mixer fitted with the paddle attachment, beat together butter and sugar until evenly combined. Add vanilla. In a medium bowl, sift flour and salt and add to the butter/sugar mixture on low speed until dough comes together. Dump onto a floured surface and shape into a disk. Wrap in plastic wrap and chill for 30 minutes. 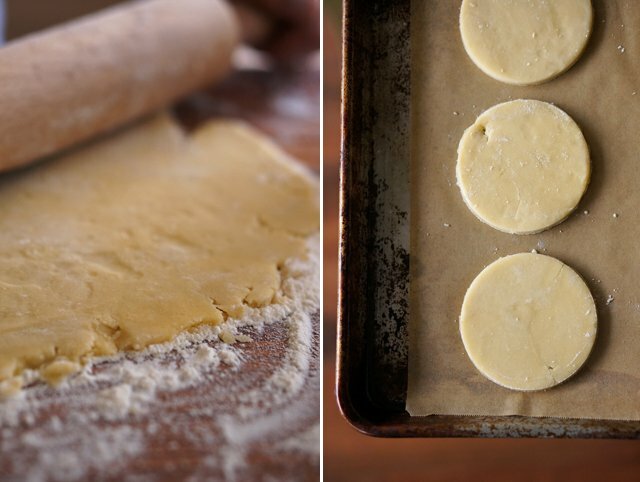 Roll dough into 1/4 inch thickness and cut shapes with a cookie cutter. Half the cookies with be full cookies and the other half will have an additional inner shape cut into it. I saved these shapes and baked them off with a little sugar sprinkled on top. No waste in this kitchen! Bake on parchment-lined baking sheet for 15 minutes or until edges begin to brown, turning the cookie sheet around once halfway through baking. Allow cookies to cool to room temperature and using a sieve, dust powdered sugar over the top cookies with the cut out. 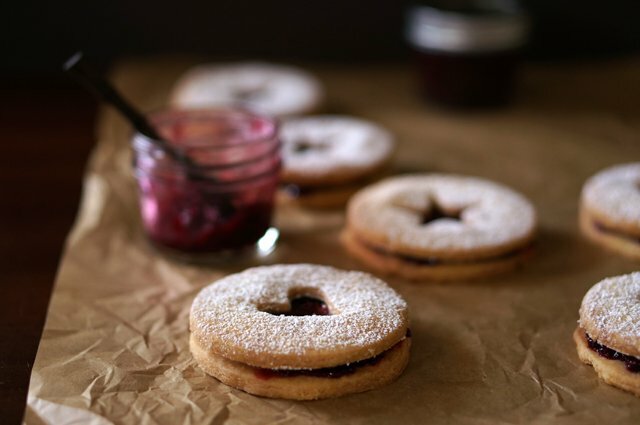 Spread an even layer of jam across the bottom cookie and carefully place the powdered sugar cookie on top. 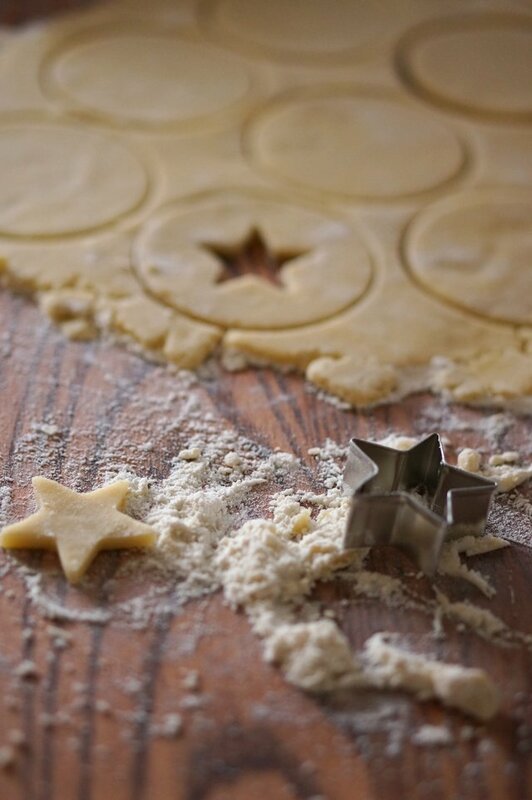 Beautiful photos to accompany some tasty-looking cookies – definitely on my christmas bake list! You are an animal! These cookies are gorgeous, and so are the photos. That jam sounds like the best thing ever – yum!!! Absolutely gorgeous! 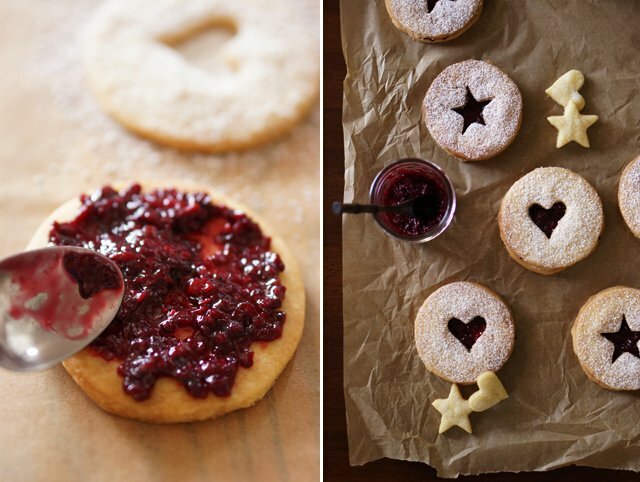 Makes me want to make some linzer cookies right now. The only thing stopping me is I know mine won’t look so amazing. GORGEOUS! Love all the storytelling with the styling, photography and side-by-sides…just splendid! 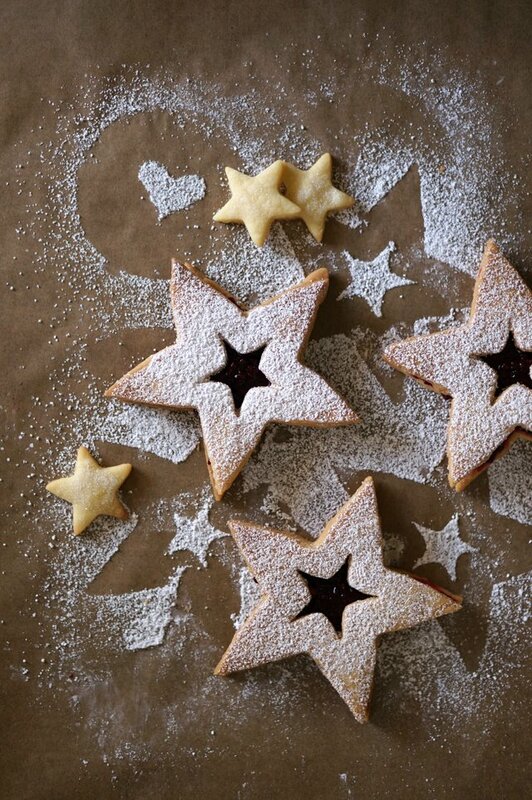 Cannot wait to bake these Linzer Cookies…need this twist with blackberry jam for one of my all-time favorite holiday cookies. I adore everything blackberry. Thanks for sharing! 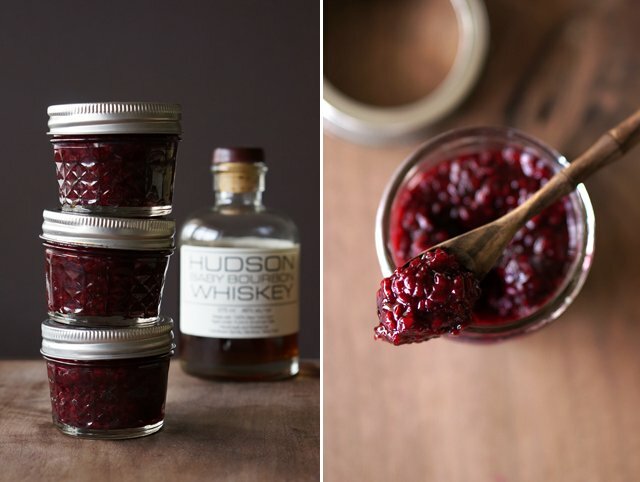 How gorgeous- these look delicious and the photos and styling are really beautiful. OMG, those look so good!! I’ll have to try and find a way to get some to you! Taste test results: approved! The jam is so delicious. Yum! These look sooooo scrumptious! I love the decorative beauty and simplicity of these cookies. They’re now on my list of must-bakes for this fall season. Thanks for sharing! I LOVE linzer cookies. There is a little french bakery down the block from me that I go to all the time and order Chai tea and a linzer cookie.